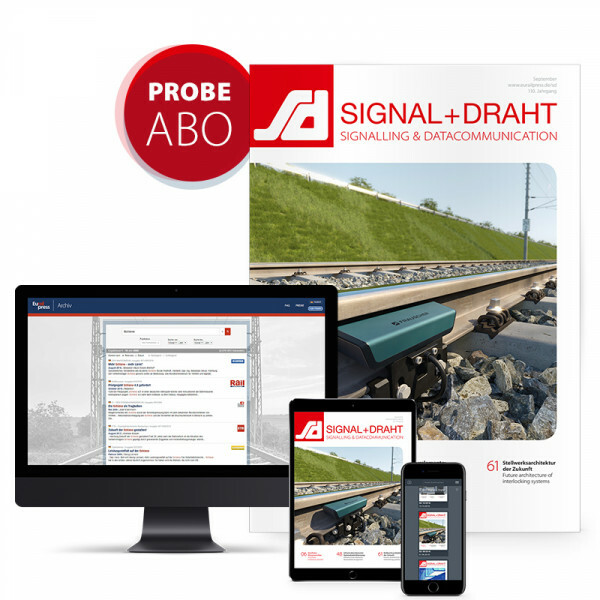 Since its foundation in 1906, the trade journal SIGNAL+DRAHT has been a pioneer and companion of modern signalling, communication and information technology in rail transport. The magazine is published completely in German and English. For more than 15 years, SIGNAL+DRAHT has also organised the annual international congress, which regularly attracts over 300 international participants. The SIGNAL+DRAHT Advisory Board is made up of leading figures from the entire rail transport industry and thus reflects a who's who of the rail industry. Test SIGNAL+DRAHT today for 2 issues with a trial subscription. There are no costs for this. You can cancel the trial subscription at any time during the trial period. If we do not hear from you, you can then purchase SIGNAL+DRAHT as an annual subscription at the current price of € 224.00 (plus VAT, incl. postage/ abroad plus postage).